Still stinging from the throat wound administered by a gorilla sharpshooter during the hunt, Taylor is transported by horse-drawn wagon to the apes' picturesque city, which is called... uh... Ape City. The next scene takes place in a crude examination room, the walls and tables are shaped oddly and irregularly... like a bunch of stupid monkeys designed the place. 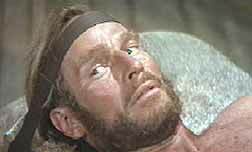 Rendered speechless by his injury, Taylor is laid out and strapped down to a stone slab. A chimpanzee nurse is administering a blood transfusion, and the wild female human Taylor spotted just before the hunt just happens to be the blood donor. Zira: Which one was wearing the strange clothes? Galen: That was my son... we think he's gay. 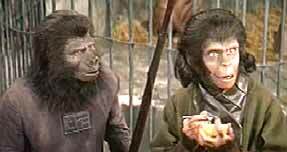 Zira: No, no... which human was wearing the strange clothes? Galen: Oh... it was this one (motioning toward Taylor). Galen: I don't know. This beast has lost a lot of blood. Zira: He's quite an unusual speci... OH MY LORD! Would you take a look at those thighs! They look like they've never seen the light of day! Galen: ...pliers, toenail clippers, corkscrew, TX-9, icepick... THERE'S NO PROBE HERE! (shouts at nurse) FIND ONE! At the mention of TX-9, Taylor's eyes fly open. He loves TX-9. Zira: This place is dirty, doctor. Galen: Doctor, these animals are dirty. They stink and carry communicable diseases. Why aren't they cleaned up before they're brought here? That male there smells like horse dung. Zira: You don't sound happy in your work. Galen: I'm little more than a vet in this laboratory. You promised to speak to Dr. Zaius about me. Zira: Yeah, well... I promise a lot of things, jackass. 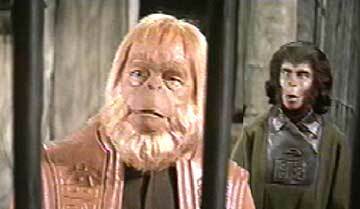 Zira: You know how Dr. Zaius looks down his nose at chimpanzees. Galen: But the quota system's been abolished. You made it, why can't I? Zira: What do you mean, "made it?" I'm an animal psychologist, that's all. We have no authority. Galen (sarcastically): You do all right when it comes to getting space and equipment. 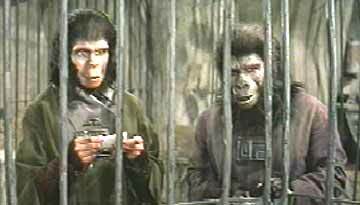 Zira: That's because Dr. Zaius realizes our work has value. The foundations of scientific brain surgery are being laid right here...in studies of cerebral functions of these animals. Galen: They're still dirty, Doctor. Did I mention that this one smells like horse dung? Zira: (sigh) Yes, you did. Galen: WELL, HE DOES! HE'S A DIRTY, DIRTY, DIRTY BOY! 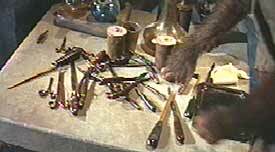 Zira: OK, OK, I got it already. 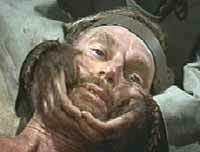 Galen (to nurse): Hold his jaw! 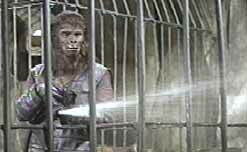 A few days later... cut to a scene of a uniformed gorilla hosing down a caged compound. Julius: Good morning, Dr. Zira. Zira: Good morning, Julius... how's our patient today? Julius: No change. The minute you open the door, he goes into his act. Zira: Well... and what do we want this morning? Do we want something? C'mon, speak! Come on... speak! I SAID, SPEAK, DAMN YOU, SPEAK!!! Zira: Do we want some tobacky, oldtimer? Hmm? As Julius looks on, Zira hands the human a cigarette, which he promptly snatches, and, in one swift motion, somehow immediately lights and starts puffing on it. Julius: You could get hurt doing that, doctor! Zira: Oh, don't be silly... he's perfectly tame. Julius: Huh! They're all tame until they take a chunk out of you. Zira: Well, Bright Thighs... is our throat feeling better? Zira: Still hurts, doesn't it? Julius: See? He keeps pretending he can talk! Zira: Yes, and you keep pretending that you're not an idiot. Zira: That Bright Thighs is remarkable! He keeps trying to form words! Julius: You know what they say... human see, human do. And, believe me... human pee, human doo doo. A LOT. Julius: What'd I tell you? TRY IT AGAIN AND I'LL TEAR YOU A NEW ONE! Dr. Zaius: Save it, banana-breath. Open up these! Zira: Bright Thighs... show him. Go ahead... do your trick! Taylor pulls out a deck of cards. Zira: No, no, no...the pretending-to-speak trick. 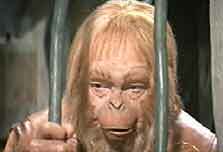 You gotta see this, Zaius! 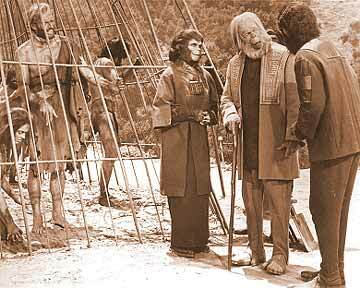 Zira: Oh, I'm sorry... You gotta see this, Dr. Zaius... Bright Thighs, go on... speak! Speak again! Zira: There! Can you believe it? Dr. Zaius: Yes, amusing... a man acting like an ape. I see it all the time. I watch the MTV, you know. Zira: Dr. Zaius... I could swear he's answering you! Dr. Zaius: He's has a definite gift for mimicry. Zira: Look! He's moving his fingers! Dr. Zaius: Only because he saw you moving yours. Dr. Zaius: Man has no understanding. He can be taught a few simple tricks... nothing more. Dr. Zaius: Typical human behavior. Man is a nuisance. He smokes up his tobacky supplies in the forest, then migrates to our green belts and ravages our crops. The sooner he is exterminated, the better. It's a question of simian survival. After his overly dramatic monologue, Zaius spins around and steps right into a slop bucket. He tries shaking his leg to dislodge the bucket, sloshing its contents all over the floor and his pant leg. Amid stifled laughter from all present, even the humans, he storms out of the compound, dragging the clanging bucket, in a big hissy fit. Just after Dr. Zaius leaves, a pair of gorilla guards bring in a female human, the same one from the hunt and the blood transfusion. They bring her to Taylor's cage. Julius: Is this the one you wanted, doctor? Zira: Yes. Thank you. Bright Thighs, I've got a present for you. This takes Taylor by surprise and he doesn't know what to make of it. Zira: Put her in with him! A giggling Julius unlocks Taylor's cage and snaps the female on the rear with a wet towel as she enters. Taylor looks her over from head to toe as Zira observes and chuckles. Taylor gives Zira a half-smile in return. 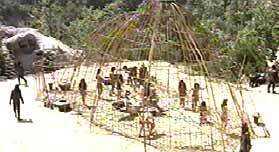 The next scene is of a large outside enclosure... a big jungle-jim type playset that contains a dozen or so wild humans and other equally unsavory characters. Uniformed gorilla guards pace the perimeter of the enclosure. Taylor wanders around the inside of the pen with his female a step behind him. Taylor notices this and starts making repetitive moves that she imitates. He starts doing the twist and she does too. Zira: There's Bright Thighs... the one I was telling you about! Cornelius: What's so special about him? I mean, besides those white legs? Zira: Watch... Hello, Bright Thighs! How's our throat today? Taylor ignores this comment. He kneels down and, using his finger, starts to scrawl out a message in the sand. His female companion kneels down as well and touches the inside of her arm. Cornelius: Zira, really! You know they can't...hey, watch out, here comes the Z-Man. Dr. Zaius... yes, Dr. Zaius again... approaches with a gorilla officer. 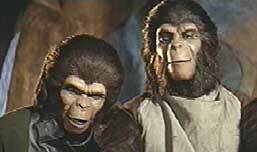 Zira: You know Dr. Cornelius, my fiancee? Dr. Zaius: Of course, the young ape with a shovel. Cornelius: And you, the old ape with a bucket. Everyone in the nearby vicinity bursts into uncontrollable laughter. The lighthearted moment is soon interrupted as Taylor's female starts brushing away the message he has written. He shoves her backwards away from it just as a male human starts screwing with his message, too. Taylor knocks him backwards. Loud bongo music is heard as the outraged male charges Taylor and, boy, we's got us an all out brawl started. Taylor takes a few punches and kicks and then starts laying into the guy with some Kung Fu moves and some Three Stooges' slapping and eye-poking. The fight is immediately broken up by a gorilla guard with a torch. The flame glances across Taylor's shoulder as he grits his teeth in pain. Zira: Stop! You've hurt him! Take him inside! The gorilla guards secure Taylor's neck using a leash attached to a pole and lead him back to his cage in the laboratory compound. Taylor collapses in a heap upon the straw-covered floor of the cage. Zira: Oh, those fools and their torches. Do you have any ointment? Julius: (winks) What do you have in mind, baby? Zira: It's for Bright Thighs' burn, you imbecile! Do you have any? Suddenly and without any warning, Taylor leaps up and rushes Zira. He grabs her and snatches a pencil and pad of paper from her pocket. He releases her and runs to the far end of his cage. Julius: I told you what you'd get!!! Zira: Julius! Don't, don't! Don't! It doesn't matter! Julius, don't hurt him! Julius: Natural born thieves, aren't they? Zira's jaw drops open as she looks at a message written on one of the slips of paper that Julius retrieved from Taylor. It slowly dawns on her that she has discovered something incredible. Zira: Get me a collar and leash... I'm taking him out of here. Julius: He's vicious, doctor! Besides, it's against the rules! Zira: DO AS I SAY! Julius quickly obliges as Zira looks up at Taylor with astonishment and wonder... like a teenage girl gazing upon a member of N'SYNC. Taylor looks at her with the satisfying knowledge that he has finally managed to communicate his intelligence to this bunch of monkeys. He's also hoping that he can get some snack crackers soon. Zira: You... you wouldn't hurt me, would you... Taylor? Part 5: My Name is Taylor, Dammit!